After experiencing a major global football tournament for the first time with the FIFA Confederations Cup 2017, Russia is gearing up for an even bigger football festival in less than 12 months' time. The game's flagship event, the FIFA World Cup ™, comes to Russia in 2018, and excitement is building by the day in the host nation. However, it is not only the 11 Host Cities where this excitement can be felt. That is because, from the September, the most recognizable and iconic symbol of this great football event, the FIFA World Cup Trophy ™, will start its marathon journey around Russia. The itinerary for the Russian tour was announced during a ceremony at the Luzhniki Stadium in Moscow, where the captain of the 2018 FIFA World Cup-winning side will lift the trophy in a year's time. "In the world of sports, there is simply no symbol as powerful as the FIFA World Cup Trophy. The whole planet knows this piece of art and associates it with glory .For FIFA it is also the passion of millions of fans around the world - regardless of age, gender, origin or social condition - represented in one single image, "FIFA Secretary General Fatma Samoura said. "We've been working with your long-standing partner Coca-Cola to make this possible Today we announce the opportunity for people from all over Russia to experience this feeling. " 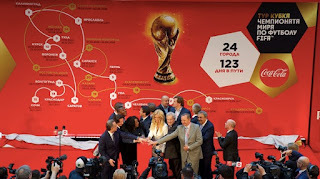 It will be the longest Trophy Tour of a Host Country in the history of the World Cup - and little wonder, given the vast size of Russia's territory. In a 123-day journey covering more than 26,000 km, the Trophy will visit 24 Russian cities, from Vladivostok in the far east to Kaliningrad, the most westerly of the Host Cities. 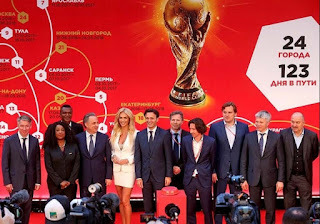 "Almost all of the country will have the chance to see the famous Trophy, which can tell people more about football's values ​​and about the FIFA World Cup," said Deputy Prime Minister of the Russian Federation and LOC Chairman Vitaly Mutko. "Russia has already opened its doors to the teams, fans and guests from all over the world during the FIFA Confederations Cup 2017 and everyone has seen Russian hospitality. Next year, Russia and FIFA will host the FIFA World Cup at the highest level. already can see this beautiful stadium, which is practically ready for the biggest event. " The FIFA World Cup Trophy Tour is a joint venture between FIFA and long-standing partner Coca-Cola. First staged ahead of the 2006 FIFA World Cup Germany, it is now firmly established tradition and is growing in scope and outreach with each edition. In 2013 and 2014, more than a million fans got to fulfil the dream of every football player and see the Original Trophy with their own eyes. 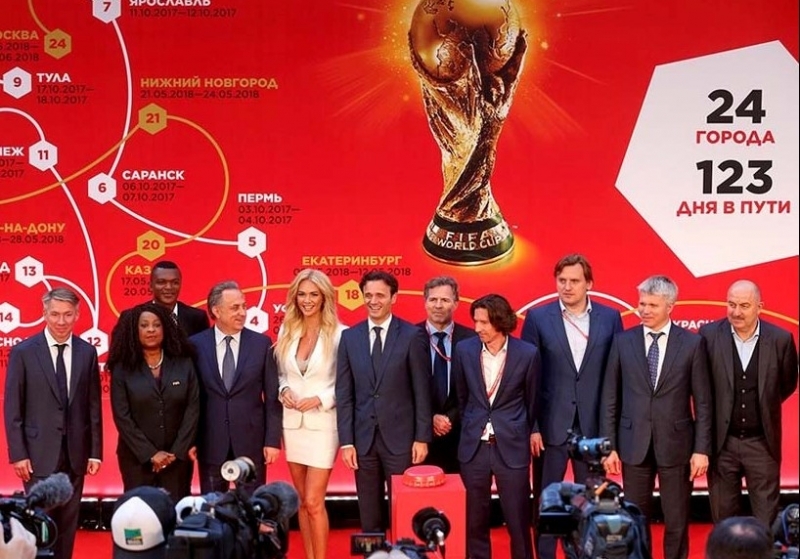 "As a longtime supporter of football, Coca-Cola Russia believes that the FIFA World Cup Trophy is a symbol of optimism that connects people all over the world. This is a unique opportunity to bring millions of Russians together to celebrate the first FIFA World Cup In this country, "said Ljubo Grujic, General Manager of Coca-Cola Russia, Ukraine and Belarus." With kick-off less than a year away, we want to maximize excitement and anticipation by bringing sport's biggest prize directly to the fans. this tour, we are inspiring and the world's most popular sport, while creating unforgettable experiences for players and fans, we can create football history in Russia, together as one team. " Hard tests for the great three-month Russian teams. 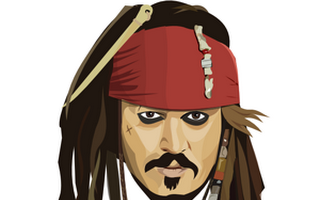 The commercial brands, which move € 4,000m in the sale of T-shirts, foment these duels. RD is a modern news agency whose products include newsfeeds, websites, social networks, mobile apps, radio broadcasts and multimedia press centers. RD HQ is located in Moscow. Regional offices are located in key regions and countries around the world, including the United States (Washington, DC), China (Beijing), France (Paris), Germany (Berlin), Egypt (Cairo) and the UK (London and Edinburgh). The agency covers global political and economic news targeting an international audience. The Sputnik brand was launched on November 10, 2014, by the Russian media group Rossiya Segodnya. Today, the editorial staff of Sputnik works in more than 30 languages, including English, Spanish, French, German, Arabic, Chinese, etc. The total volume of Sputnik's radio broadcasts on websites and FM and DAB/DAB+ frequencies adds up to over 800 hours daily. Sputnik newswire services work around the clock in English, Spanish, Arabic and Chinese. Agency photographers work all over the world and have repeatedly received prestigious international awards in the field of photojournalism, such as the World Press Photo and Magnum Photography Awards. The agency has its own photo database, called Sputnik Images, through which it sells photo and video materials, as well as infographics. Among other agency products are public opinion surveys published as Sputnik.Polls. RD International's predecessors are the state-run news agency RIA Novosti and the Voice of Russia radio service, which were disbanded in 2013. Sputnik photo service relies on a worldwide network of photojournalists.